DVD News: Colin Firth's The King's Speech coming to DVD and Blu-ray April 19th! The 4-time Academy Award Winning film, The King's Speech is coming to DVD and Blu-ray April 19th! DVD Active has the following DVD and Blu-ray info for Academy award winning film, The King's Speech(Best Picture) starring Academy Award winnerColin Firth (Best Actor),Academy Award Nominee Geoffrey Rush, Academy Award Nominee Helena Bonham Carter, and Jennifer Ehle. Anchor Bay Entertainment and The Weinstein Company has announced DVD ($29.98) and Blu-ray ($39.99) releases of The King's Speech for April 19th. Extra material will include an audio commentary with director Tom Hooper, a 20-minute “Making Of The King’s Speech” featurette, archival footage of the actual King George VI, and much more. 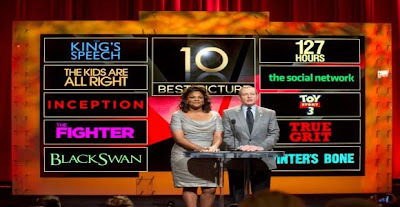 Live Blogging: The 2011 Oscars with The King's Speech winning 4 including Best Picture and Best Actor for Colin Firth!!! The 83rd Annual Academy Awards is on now over now (eastern time)! On TV Tonight: Watch Colin Firth, The King's Speech, Inception, Barney's Version, co-host Anne Hathaway, etc. at the 2011 Oscars! Tonight is a big night for Hollywood and its movie stars as Academy Award nominees James Franco (nominated tonight for 127 Hours for Actor in a Leading Role) andAnne Hathaway (previously nominated for Actress in a Leading Role forRachel Getting Married) are co-hosting the Oscars award ceremony at 8 PM ET/5 PM PCT (the red carpet starts at 7 PM ET/4 PCT prior to the award show!). So, don't miss tonight's the83rd Academy Awards as The King's Speech starring Colin Firthleads with an amazing 12 Oscar Nominations!!! Congrats and best of luck to CF and TKS!!! The King's Speech leads Oscar Nominations with 12 including Best Actor for Colin Firth! Tonight on PBS Masterpiece classic, watch Episode 3, the conclusion of Any Human Heart miniseries starringMatthew Macfadyen, Jim Broadbent, Sam Clafin, Haley Atwell, Gillian Anderson, and Tom Hollander.Check local listings for air times in your area! The Orlando Sentinel reports that Kat Dennings, Chad Michael Murray and Rupert Friend are all cast in and have started filming (Wednesday), “The Renee Project” (working title), in Orlando, Florida. The indie drama isbased on the true story of Renee Yohe, whose battle with drugs, depression, addiction and cutting led to the creation of the charity group To Write Love On Her Arms. The Academy of Science Fiction, Horror and Fantasy Films have announced the nominations for the37th Annual Saturn Awards, which honor excellence in all things gruesome, awesome and everything in between for both movies and television. Inception leads the Saturn nominations with 9, Never Let Me Go with 5 including in the acting categories for our P&P/Bennet girlsKeira Knightley andCarey Mulligan, and Matthew Macfadyen's Robin Hood film with 2. The 37th Annual Saturn Awards will take place in Burbank, CA in June. BothSony Pictures Home Entertainmentand Amazon.com have the following DVD and Blu-ray information from the 2010 film release, Made In Dagenham starring Sally Hawkins, Miranda Richardson, Bob Hoskins, and Rosamund Pike, which will be released on DVD and Blu-rayMarch 29th. Pre-order your copy of either:Standard DVD orBlu-ray at Amazon.com. Principal photography beginsFebruary 17 on Edwin Boyd - about a Canadian war veteran turned bank robber — starring Barney’s Version actor Scott Speedman in the title role alongside BAFTA award-nominee Kelly Reilly as Boyd’s wife. Dame Judi Dench who is constantly busy with several new movies (every year and more) coming soon (ie. 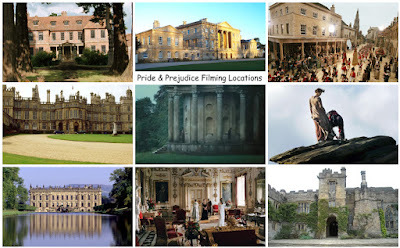 Jane Eyre with Tamzin Merchant, The Best Exotic Marigold Hotel with Penelope Wilton, and My Week with Marilyn to name a few) was seen on set recently filmingJ. Edgar (directed by Clint Eastwood) with co-star Leonardo DiCaprio. Judi Dench plays Dicaprio's title character J. Edgar’s mother Anna Marie Hoover. Naomi Watts is set to portray Helen Gandy, a loyal secretary of Hoover, and Ed Westwick (Gossip Girl) is cast for the role of Agent Smith, a clean-cut operative hired by Hoover to write his biography. THR reports that Baz Luhrmann's adaptation of F. Scott Fitzgerald’s 1925 classic, The Great Gatsby starring Leonardo DiCaprio as Jay Gatsby and Carey Mulligan as DaisyBuchanan will start filming in Sydney, Australlia in August for 17 weeks and will be shot in 3D! Read the article below for more info. Sydney -- Baz Luhrmann's 3D take on The Great Gatsby will shoot in Sydney in August -- beating out the iconic story's home town of New York -- after a deal was signed with the New South Wales (NSW) state government Friday, it was announced here Sunday. The film is the first live-action 3D movie to be shot in NSW. Filming will take place at Sydney's Fox Studios, with Warner Bros. backing the feature and Luhrmann's Bazmark Films producing. Leonardo DiCaprio will star as Jay Gatsby while Carey Mulligan has been offered the role of Daisy Buchanan. Following my recent post here about Kelly Reilly returning and reprising her role in sequel to Sherlock Holmes 2, now a first photo has surfaced online of Kelly Reilly as Mary Morstan, lady love of Jude Law's Dr. Watson character in the sequel to the 2009 blockbuster hitSherlock Holmes. The sequel now has a title: Sherlock Holmes: A Game of Shadows,in theaters December 16th! Below you can see a teaser photo scan from an issue of Empire magazine. It shows Watson (Jude Law) getting ready to be hitched to a lovely lady, Mary Morstan played by Kelly Reilly, with Holmes off to the side. Check it out! Tonight on PBS Masterpiece classic, watch Episode 2 of Any Human Heart starringMatthew Macfadyen, Jim Broadbent, Sam Clafin, Haley Atwell, Gillian Anderson, and Tom Hollander.Check local listings for air times in your area! 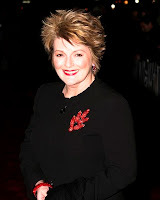 Today is the 65th birthday of two-time Academy Award Award NomineeBrenda Blethyn, best known to us P&P fans as Mrs. Bennet, the Bennet girls' mother in the 2005 Pride & Prejudice film as well as Grace Turner, Robbie's mother in Atonement. Joe Wright's new film, Hanna is still a couple of months away, but a new poster has appeared over at IMPA, along with the first two clips from the film, courtesy of The Guardian and Cinema Blend. Hanna starring Saoirse Ronan, Eric Bana, Cate Blanchett, andTom Hollander. In theaters April 8th. HANNA, starring Academy Award nominee Saoirse Ronan (The Lovely Bones, Atonement) in the title role. There's a new trailer for Last Night starring Keira Knightley, Sam Worthington, Eva Mendes, and Guillaume Canet. The film follows the story of a married couple (Knightley and Worthington) whose commitment to each other is tested when they are apart for a night; the husband away on work with a colleague he's attracted to and the wife as she coincidentally runs into a past love. Speaking of Last Night, Variety reports that Tribeca Film has landed theatrical, VOD and certain digital rights to the film, with Miramax retaining home video, TV sales and long-term digital rights. The film is now being prepped for a spring theatrical release in major markets like Los Angeles and New York with VOD also in the works. 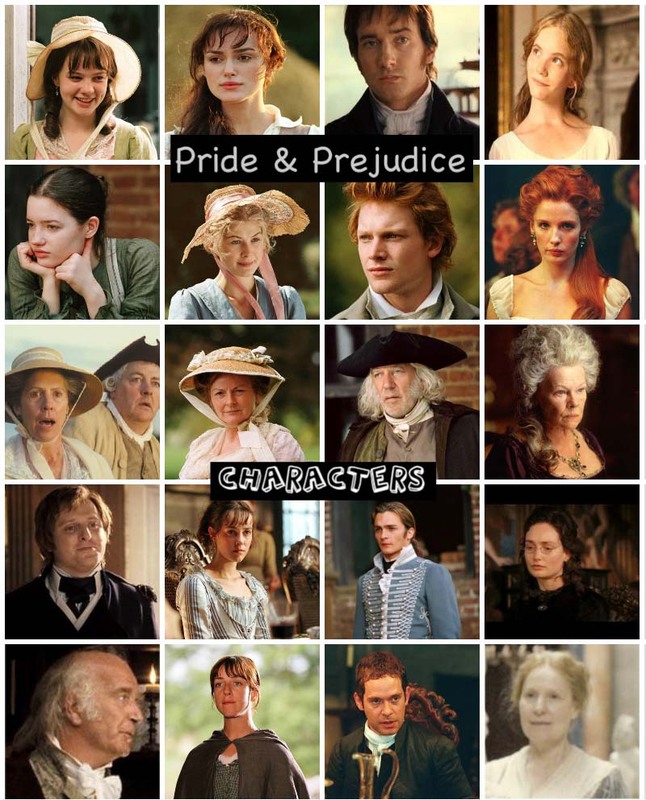 'Pride & Prejudice Country'Pride & Prejudice (2005) film stars Keira Knightley, Matthew Macfadyen,Brenda Blethyn,Donald Sutherland, Tom Hollander,Rosamund Pike,Jena Malone, and Judi Dench. 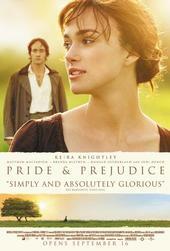 Movies are often an inspiration for travelers, especially when the location is as beautiful as the English countryside. Talulah Riley attended the 2011 Orange British Academy Film Awards at The Royal Opera House on February 13, 2011 in London, England. Talulah Riley and Slumdog Millionaire's Dev Patel were on stage and presented the award for Costume Design to Colleen Atwood for Alice In Wonderland. Check out new photos of TR! Looks like her hair color is almost back to her natural color! Rosamund Pike attended and was a co-presenter (with her An Education co-star Dominic Cooper) at the Orange British Academy Film Awards 2011 held at The Royal Opera House on February 13, 2011 in London, England. Rosamund Pike and Dominic Cooper presented an award for Original Screenplay, in which David Seidler won for The King Speech! (The King's Speech won 7 BAFTA awards for the night including Seidler for Original Screenplay, Colin Firth for Leading Actor, Helena Bonham Carter for Supporting Actress, Geoffrey Rush for Supporting Actor, Best Film, Outstanding British Film, and Alexander Desplat for Original Music). Congrats to CF and The King's Speech!!! Check out new photos of the always gorgeous RP! More Romantic Movies list here! 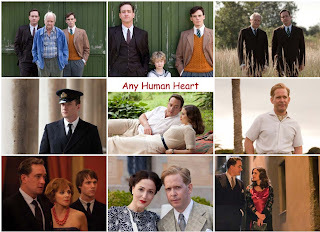 Any Human Heart, which stars our very own Matthew Macfadyen (Mr. Darcy) and Tom Hollander (Mr. Colins), former P&P co-stars in their 4th TV and film projects (Any Human Heart, Pride & Prejudice, Enigma, Maybe Baby) they appeared and co-starred together. Jim Broadbeant, Sam Clafin, Hayley Atwell, and Gillian Anderson co-star. 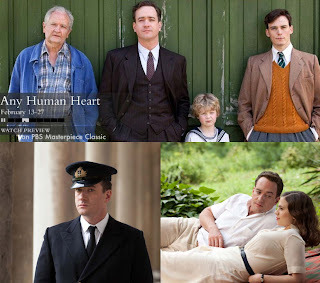 Any Human Heart, which stars our very own Matthew Macfadyen (Mr. Darcy) and Tom Hollander (Mr. Collins) will premiere tomorrow night on PBS Masterpiece Classic! BBC One's new 3-part series South Riding starring starring David Morrissey (The Other Boleyn Girl, Sense and Sensibility 2008), Anna Maxwell Martin (Becoming Jane, North & South), and Penelope Wilton (Downton Abbey, Pride & Prejudice 2005) written and adapted by Andrew Davies (P&P '95, Little Dorrit, Doctor Zhivago 2002, Wives & Daughters, The Three Musketeers 2011, etc.) 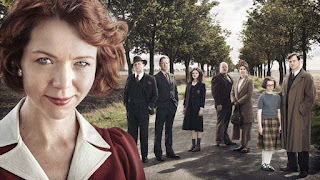 from Winifred Holtby's novel of the same title will premiere this month, February 20th (part 1 of 3) on BBC One (see two clips here). 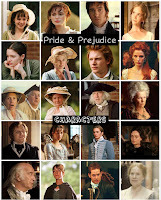 Focus Features (Pride & Prejudice and Atonement)' upcoming new film adaptation of Charlotte Bronte's Jane Eyre starring Mia Wasikowska, Michael Fassbender, Jamie Bell, Judi Dench (Pride & Prejudice's Lady Catherine), Sally Hawkins (2007 Persuasion' Anne Elliot), andTamzin Merchant (Pride & Prejudice's Georgiana Darcy) will be in select theaters March 11th, just a month from today. Focus Features has released 5 new clips from the new JE film with one of them featuring Judi Dench as Mrs. Fairfax and the otherwith Tamzin Merchant, who plays Mary Rivers. Check out and watch them below! In theaters nationwide today, The Eagle (formerly titled: The Eagle of the Ninth) starring Channing Tatum (Dear John,G.I. Joe: The Rise of Cobra, Step Up), Jamie Bell (Defiance, Jumper), Mark Strong (Sherlock Holmes, The Young Victoria), and Donald Sutherland (Pride & Prejudice, The Italian Job, Cold Mountain, MASH, Ordinary People, etc.). Marcus is a wounded Roman soldier living in Britain during the 2nd Century A. D. Along his Celtic slave, Esca, Marcus undertakes on a perilous journey into the wilds of the far north in an attempt to retrieve the Eagle emblem of the vanished Ninth Legion, which was lost under Marcus father's command ten years before. According to Up and Comers, Keira Knightley will NOT be co-starring with Twilight's Robert Pattinson in his upcoming film, Cosmopolis (aspreviously rumored and posted here), which will be directed by David Cronenberg who just directed Keira in her upcoming film, A Dangerous Method. Keira Knightley will not be appearing in David Cronenberg’s “Cosmopolis”, the actress’s reps confirmed to us today. Knightley was brought into the casting conversation following some eagle-eyed fans seeing her name listed alongside star Robert Pattinson’s on the production company’s website. When the internet exploded with the news, her name was quickly removed and her reps declined to comment on her involvement until today, with a solid “she’s not in it”. Donald Sutherlandrecently attended the ceremony honoring him with a Star on The Hollywood Walk of Fame on January 26, 2011 in Hollywood, California. His Horrible Bosses co-star Colin Farrell (who also co-starred with Keira Knightley in London Boulevard and Kelly Reilly in Triage) was in attendance at the ceremony to honor him as well. Deadline reportsthat Rosamund Pike(Photo by Ian Gavan/Getty Images Europe) is currently in talks and close to finalizing a deal to play Andromeda in the Jonathan Liebesman directed film "Wrath of the Titans" (and is said to be shot in 3D, according to Variety), taking over for Alexa Davalos who played the part in Louis Leterrier‘s “Clash Of The Titans.” If Miss Pike is officially cast as Andromeda, she joins the rest of an interesting cast that currently include Sam Worthington, Gemma Arterton, Edgar Ramirez, Toby Kebbell, Liam Neeson and Ralph Fiennes. Finally, there's news and a confirmation whether or not Kelly Reillyand co-star Rachel McAdams are returning for theforUntitled Sherlock Holmes Sequel, which is currently still filming and is set for a December 16, 2011theatrical release. Although the new BBC4 dramaWomen In Love starring Rosamund Pike is still coming up soon possibly sometime in the spring or early autumn of this year, a new production still featuring RP (see image to your left) has recently been added on the Women In Love page on BBC. Rosamund Pike, Rachael Stirling, Rory Kinnear and Joseph Mawle star in Women In Love, a compelling new two-part drama by William Ivory. Based on two novels by DH Lawrence – The Rainbow and Women In Love – which Lawrence originally intended to publish as one, Ivory has melded the books together in line with the author's original vision as part of BBC Four's new Modern Love Season. Watch a new 'Hanna' trailer! Watch a brand new trailer forJoe Wright's upcoming film,Hanna.Hanna starring Saoirse Ronan, Eric Bana, Cate Blanchett, andTom Hollander. In theaters April 8th. The new trailer looks dangerously good! Check it out and watch it below! Following the big casting announcement last Sunday of British actor Henry Cavill (The Tudors ... See a screen cap of Henry and P&P's Tamzin Merchant from The Tudor's Season 4) in the role of Clark Kent/Superman in the new Zack Snyder's “Superman” film, rumors quickly turned to who will play Lois Lane? but word just emerges that the search is on for a female lead, a character that isnot Lois Lane. Variety reports that Rosamund Pike,Alice Eve, and Diane Kruger have emerged as a contender for the role that is not yet being disclosed. With Henry Cavill set as the Man of Steel, Warner Bros. now moves on to its female lead, and a short list of contenders is coming together. Alice Eve, Diane Kruger and Rosamund Pikehave emerged as the three thesps being considered for the character, whose identity hasn't been disclosed -- but it's not Lois Lane. After watching and featuring here last month'sDownton Abbey, which was a big success in both the UK's ITV and the US' PBS Masterpiece classic. It's time for another period drama for the month of February! This time, I'm eagerly anticipating Any Human Heart, which stars our very own Matthew Macfadyen (Mr. Darcy) and Tom Hollander (Mr. Colins), former P&P co-stars in their 4th TV and film projects (Any Human Heart, Pride & Prejudice, Enigma, Maybe Baby) they appeared and co-starred together, will premiere Sunday night, February 13th on PBS Masterpiece Classic! I've updated my previous "The Many Faces of Elizabeth Bennet & Mr. Darcy" posts with new header banners. Check them out! DVD Active has the following DVD and Blu-ray discs details and artwork for Keira Knightley and Carey Mulligan's latest film, Never Let Me Go,which was in limited theatrical release last September 15th. Fox Home Entertainment has announced DVD ($29.98) and Blu-ray ($39.99) releases of Never Let Me Go which stars Keira Knightley, Carey Mulligan and Andrew Garfield. Each will be available to own from February 1st. As far as we know, the only extra material will be a 30-minute "Secrets of Never Let Me Go" featurette which takes a behind the scenes look at the making of the film featuring the cast and crew as they chronicle the journey from book to the big screen. Photos: P&P co-stars Colin Firth and Jennifer Ehle reunited 15 years later! Colin Firth and Jennifer Ehle reunited 15 years later as they recently co-starred in the 14Oscar nominated, 12 BAFTA nominated, and 7 Golden Globe (with a win for Best Actor for CF) award winning 2010 film, The King's Speech. They were last seen together 15 years ago in the much loved Pride and Prejudice (1995 BBC/A&E TV Miniseries), which they famously played Mr. Darcy and Elizabeth Bennet. Jennifer Ehlewon for Best Actress on the BAFTA TV Awards back in 1996. 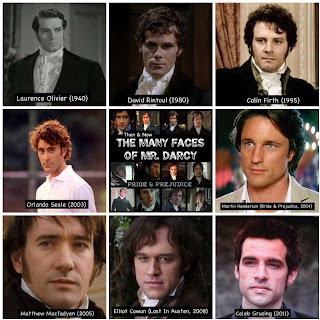 He landed the role of Mr Darcy in the BBC adaptation of Austen’s Pride And Prejudice, and with it came a year-long romance with his co-star Jennifer Ehle (who played Elizabeth Bennett).